We parties hard this Halloween season. Between the Harvest Festival/Carnival at school and the Harvest Festival/Chili Cook-off (not trunk or treat) at church, an adult Halloween party for Brian and I and then actual Halloween night, we are all sugared up and partied out! ...and used the cover for wings, she had herself a costume (after adding her own touches of stripes, sparkles, curls, leopard print and glow sticks). The boys were easy this year. Digital Dudz. done. Thank you Uncle Mark. They were a hit! The balloons behind them were filled with glow sticks, but even when the sun went all the way down, the street light was still too bright to make them glow much. I still think it looks fun, though. I may use this design in the future, only with more balloons and LED lights. When you work with glow stick, you're dealing with an expiration date. This was the Digital Dudz shirt I wore for the 2012 Halloween season. It was cool. And yes, people stared at my chest all night. Not sure how I feel about that. Over Labor Day weekend we got to go to the John Williams concert at the Hollywood Bowl! We were all so excited! This is a pretty cool concert. John Williams leads the LA Philharmonic in selections from his works while clips of the movies play around the stage. Thanks to Pandora, our kids are huge John Williams fans. They can name almost every movie he has scored (even though they haven't seen half of them). Brian and I got to attend the same concert years ago. That first time we went, we thought it was so funny that some people had brought along lightsabers and when the orchestra started playing music from star wars, they lit up their lightsabers and waved them around in the outdoor theater. This time we went, the audience was FULL of lightsabers! It was so cool! It was so neat to hear John Williams talk about many of the pieces before they played them. He talked about as a kid how he loved going to the movies and listening to the music and watching the action movies, especially the sword fighting. He said he was excited to collaborate with Steven Spielberg on a new piece that had sword fighting in it, The adventures of Tin Tin. As he was discussing with Steven (name dropping) about which clips from the movie he should show during the song, Steven suggested using sword fighting clips from many different hollywood movies, as well as Tin Tin. So they did. And it was cool. Errol Flynn, Pirates of the Carribean, Tin Tin, Tom and Jerry, The Princess Bride (the audience gasped and cheered at that part!) Star Wars (the audience went NUTS at that part!) It was really cool. To commemorate the 30th anniversary of ET, John was once again discussing with Steven which clips he could use during the concert. Steven offered to give him the last 2 reels of the film, updated into HD with the voice overs and sound effects so that the orchestra could play the music along with the film. Which was awesome! We watched the last part of the movie, which started when they steal the van with ET in it, the police chase on the bikes, flying to the forest, then saying goodbye to ET as his spaceship flies off. Briggs was a little tired that night, but when I pointed out to him how cool it was that the music we were hearing in the movie was actually coming from the stage and the orchestra, he smiled real big at that! At the beginning of the concert Ty asked, "Mom, are they playing real music, then those guys on the stage are just playing some of it?" He had never really thought about where real music comes from. It was a neat experience to show them how "real" music is made. This is a video of music from Superman. The fans were very respectful and only waved the lightsabers during Star Wars music, but Superman got them a little excited and they couldn't help waving them around a bit. If you watch any of the video clips, this is the best one, taken by Larry. The Darth Vader theme. The audience just couldn't get enough and he ended up doing 3 encores. We explained to the children what that meant, and after the third encore when people kept standing up and cheering, the kids started whining because they were tired and done, and as much as they love John Williams, they didn't want any more encores. The whole thing was such an amazing experience.. I was surprised that the theater allowed so many people to bring in distracting projectile weapons and wave them around during the performance (especially since I was accosted by the security because I tried to take in my DSLR camera - one lady told me no, two people told me yes, brian and my ticket were leaving me in a sea of thousands of people, i kept going and the armed security guy had to chase me down. seriously?). But when John Williams and the first chair violinist pulled out their own lightsabers at the end of the concert, I figured he must think this tradition is pretty cool. Thanks for a great night, Larry! Today I got to work in Ty's first grade class for the first time. The teacher had me doing reading assessments. The kids would read as much of a story as they could in one minute, and I would mark the words they didn't know or read incorrectly. Then I subtracted the number incorrect from the number correct to give them a total score. Many of the kids were below 10 or in the teens range. A small handful were in the 20's and one girl got a 64. When I tested Ty, he got 214, with no errors. I was worried that the teacher might think I had fudged the numbers, but I flipped through her student assessment book and noticed she had previously assessed Ty. He had scored a 214 with her, too. I took her and Lauren to get their nails done. I love their cute little feet! Then we went to BJ's for lunch and strawberry beignets! She was with me when I bought the wrapping paper and I asked for her approval (did you know that aqua is the new pink for Ash?). She said she liked the paper, but I had to "decorate it fancy!" Of course. The day of her actual birthday was the real treat. The whole family got together at Nana and Papas house for dinner, gifts and cake. Auntie Mae Mae and new Uncle Kevin were even able to be here. Thanks for planning your vacation around Ashlynn's birthday! Ashlynn was in her usual spunky mood on this day because she loves a big get together. It was Nana and Kevin's birthday in the month of August, so we celebrated those, as well. The mermaid tail! This thing is awesome! it has a rubber flipper in the tail so you can actually swim with it! She immediately pulled it on, then we had to carry her around everywhere! Her sock monkey PJ bottoms that Auntie Nessa skillfully re-purposed. She's pretty talented! The kids were all pretty excited to see Auntie Mae Mae. The four layer banana cake that Ashlynn insisted on. I'm more of a "buy a really nice cake at the bakery" type of mom.I'm not really a fan of frosting cakes, but she wanted this recipe, so, after only a few mental breakdowns, we had a Banana cake! Then the kids and Aunts and Uncles played games in the back yard. The kids love Nana and Papa's backyard. At one point I heard Ashlynn, with her tail on, shout, "I'll be the mermaid referee!!" and it took me back to when she was a squeaky little-er girl. Thanks for hosting a great night, Mom and Dad. And I think we did Ashlynn's birthday justice! The first day of school has come and gone, and with it the excitement and glamor that accompanies that first day, where everything is new, you know there's no homework (at least for the kids) and mom most certainly has a special snack waiting for you when you get home. Enter day five. The glamor has worn off. We are all tired and out of sorts. We miss sleeping in and not having a schedule. It's hard to adjust to being on time, answering to teachers and rules and navigating the social waters that are par for the course in school. At the end of the day, I know this phase will pass, but it takes time. And right now since I'm having a hard time adjusting to all of the rigors that a new schedule brings, I'm not really wanting to be patient. In answer to the most popular question of what I'm doing with all of my "Free Time": The same thing I've been doing - cooking, cleaning, laundry, meal planning, grocery shopping, signing a bazillion agendas daily (really just 3, but still...). I just get to do it in peace and quiet, until chaos reigns at 2:30! Last night, a bloody little ghost burst into our room and woke us up. Ty has started getting bloody noses, just like Ashlynn. Although, unlike Ashlynn, Ty doesn't quite know how to deal with them. He doesn't get scared, but he doesn't react fast enough. He thinks his nose is just running, so he keeps wiping and wiping until he's completely covered in blood. THEN he notices he's bleeding. So that's what happened to him in the middle of the night. The only problem is he's really scared of the dark. Normally when he gets scared at night he throws his blanket over his head, like a flannel force field, and trots down the hall to our bedroom, or to the bathroom, depending on his mission. So when he burst into our room last night, he was draped with his red cowboy blankie, covered in blood and dripping all over the carpet. We finally got him, the hallway, and all of his bedding cleaned up and tucked back into bed, but not before teaching him to pinch off his nose the next time it happens! 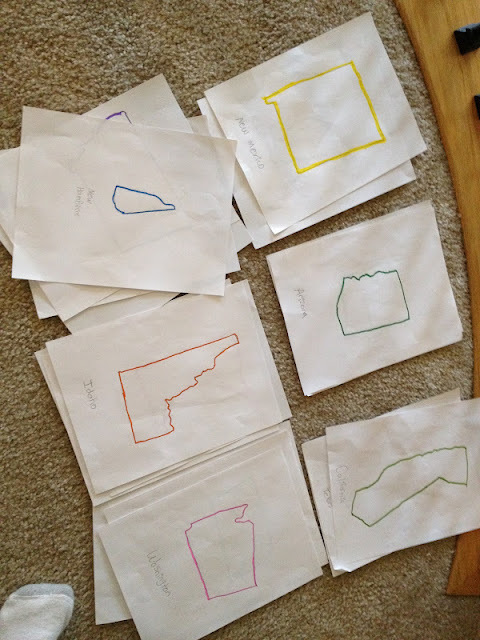 This summer, I made a deal with the kids. If they had their rooms and the loft clean by 3:00, they could play video games until Brian came home. Needless to say, their rooms and the loft were REALLY clean this summer. But until 3:00, if we weren't out exploring or doing other chores I had assigned them, they had to figure out how to entertain themselves, just like kids from the "Olden Days". So here's a little selection of some chosen activities. 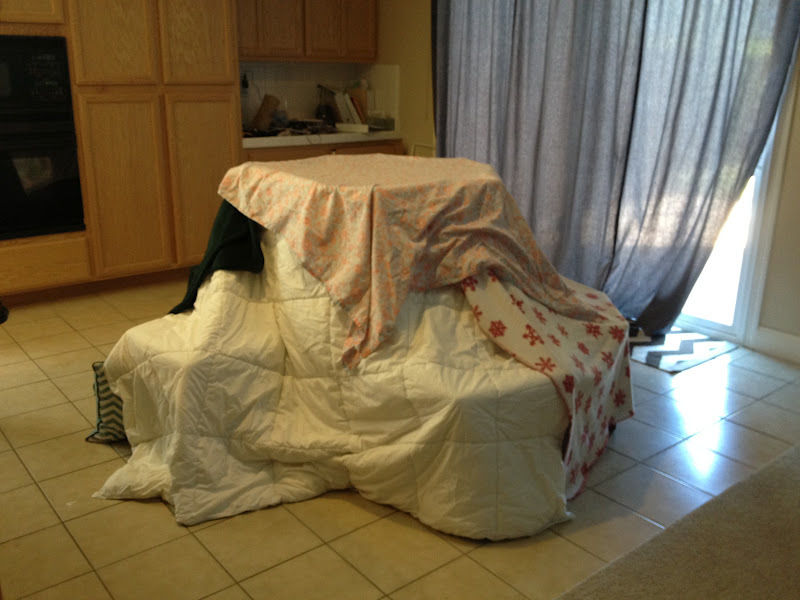 The first picture is a fort they made in the kitchen. They came running to get me and shouted, "Mom! we caught a bear!" When I peeked inside the mass of chairs, blankets and table cloths (table cloths? really?) 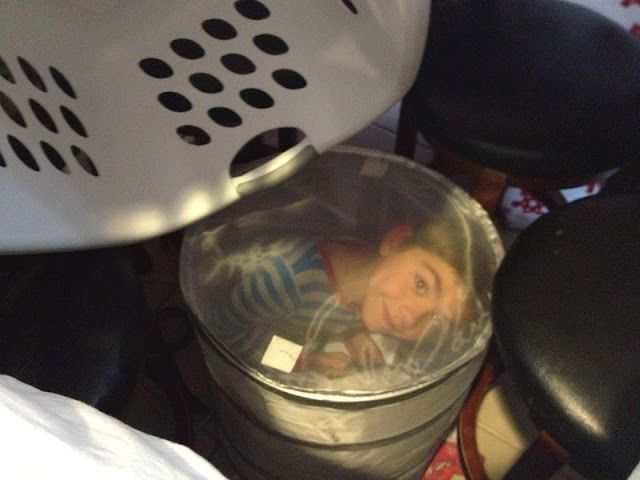 I found little man in his laundry hamper...excuse me, his cage. Please note the blue striped pajamas. Ty's PJ's were his summer uniform. Despite the heat here in Sacramento, when we would come home from the pool, Ty would run upstairs to get comfy, and come down in his PJ's. Or just stay in them all day, never actually getting dressed for the day. 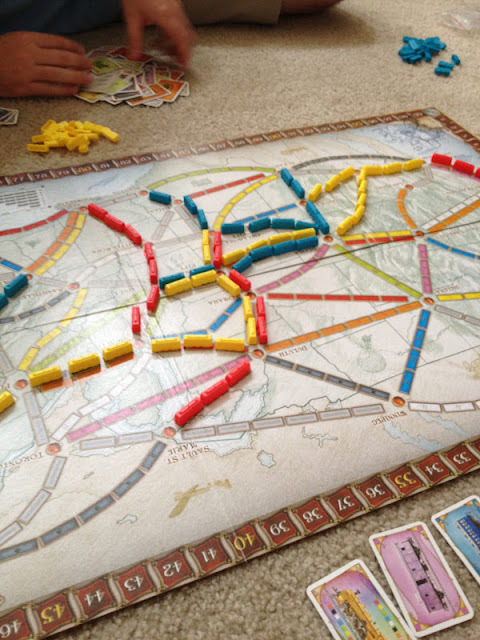 Aunty Lisa got us "Ticket to Ride" which quickly became a favorite. 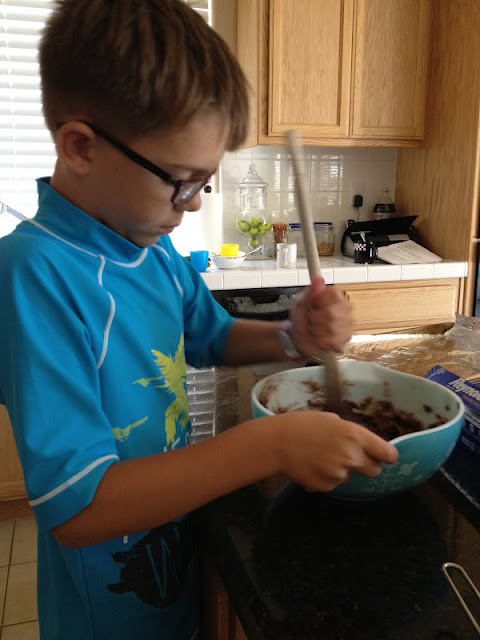 Briggs helped me make cookies for the Missionaries one day. 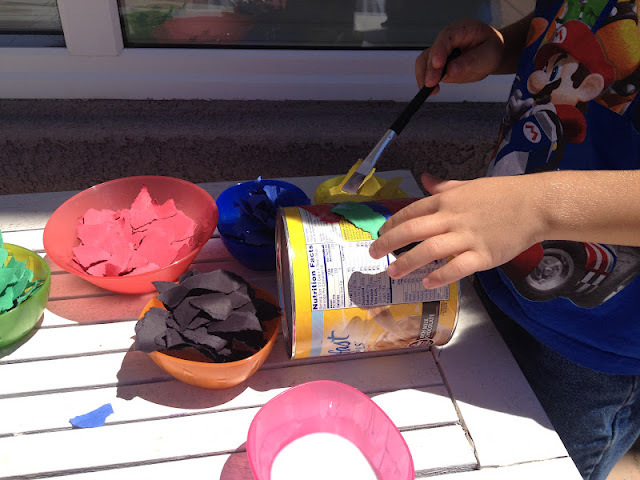 Brightly colored washi tape from Target entertained them all one afternoon. When I found these "ingredients" on my bed, I asked Ty, "What are these things?!" Ty's response, accompanied by a devious giggle was, "I'm making something!" Basically he dangled the underwear from the end of the light saber over Ashlynn's head to make her squeal. 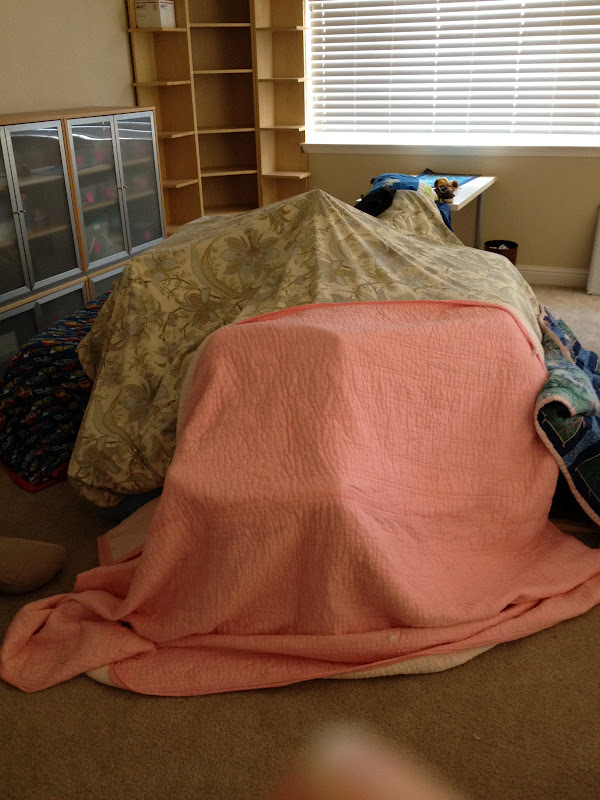 Another fort, this time equipped with the air mattress in the loft. 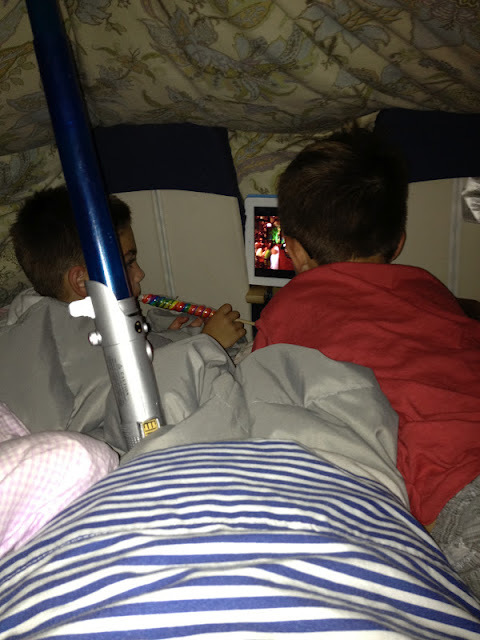 They used a light saber to prop up the blanket like a tent (that light saber came in handy this summer!) I let them sleep in this one that night (all except Briggs, that is. 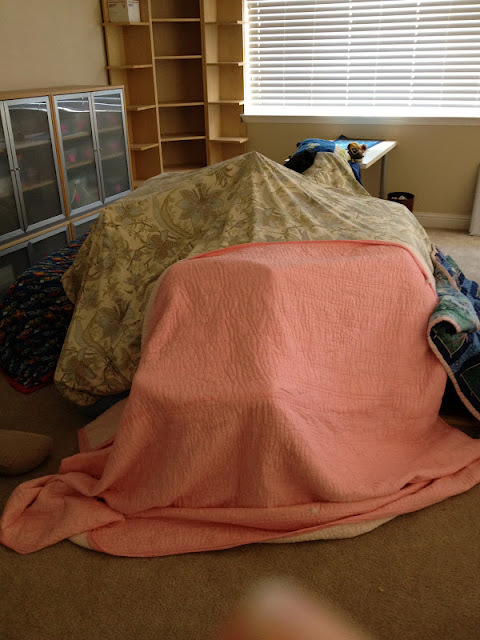 He couldn't hack it, so he slept next to the fort. Which is still pretty cool...) Oh... and I let them eat ginormous lollipops and watch movies on my ipad, cause I'm a cool mom like that. This would be Ty in my nightstand. We were reading a book, where a six year old boy rode in a dumbwaiter. After explaining what a dumbwaiter was (Cool!) 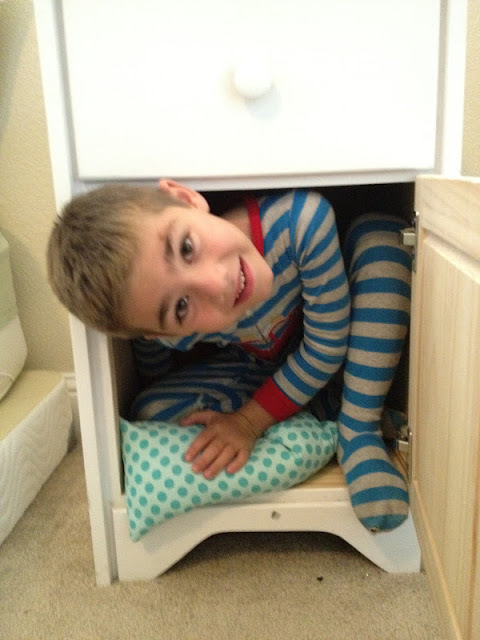 and that it was about the size of my nightstand, the PJ clad six year old had to see if he could fit. He did. Sort of. 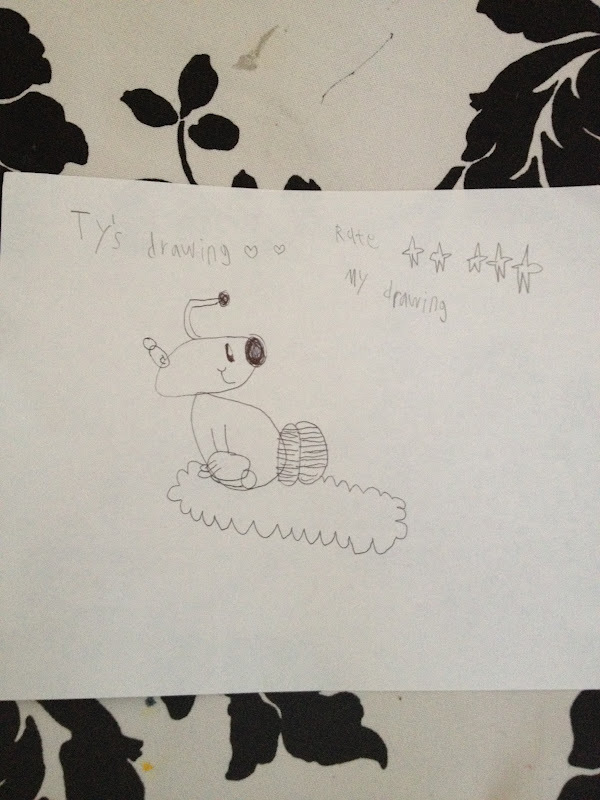 I say this drawing gets 5 stars, just like my Goodreads app! 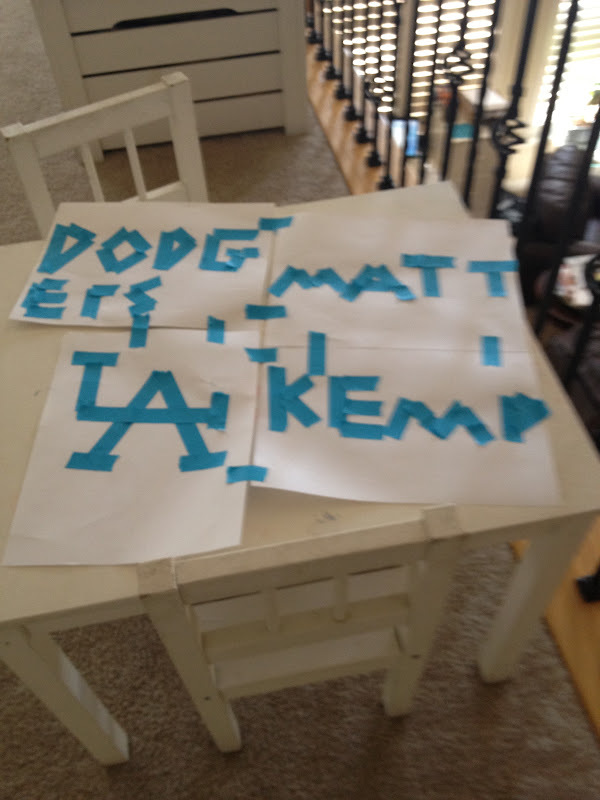 Ty's compulsion to craft got the better of him on this day and I had to make some modge podge for him. 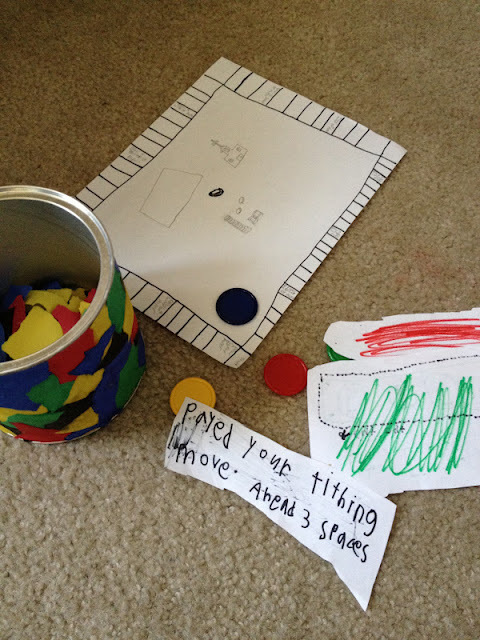 This is a board game the boys made, then made me play. Actually, they didn't do a bad job. You blindly pulled a colored scrap out of the aforementioned modge podged tub. Then you found the message card of the corresponding color, which gave you instructions. Basically lose a turn, move forward so many spaces or move back so many spaces, but with more creativity. The black one read "Payed your tithing. Move ahead 3 spaces" Funny boys.This of course, is only a smattering of the things that kept us busy (and made messes) this summer!